My boys are 2, so they are just starting to understand the idea of Santa and Christmas. It's my favorite holiday, and I wanted to give them a Santa inspired activity that also incorporates their love of putting things into (and taking things out of) boxes. I also love any craft that reuses materials that I would normally throw away. 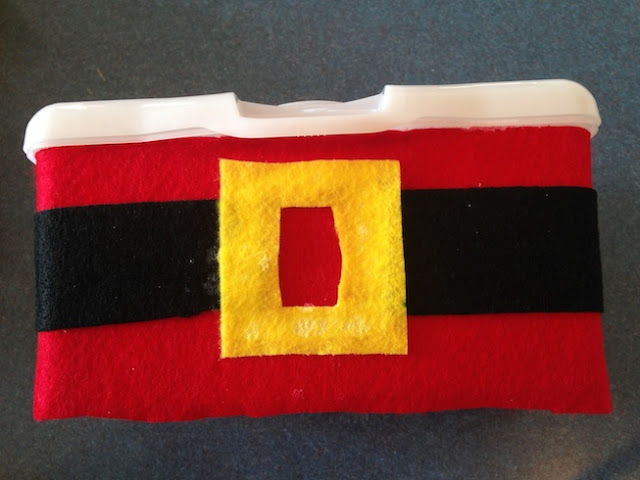 I have a million empty wipes containers, and one became Santa's Mailbox! 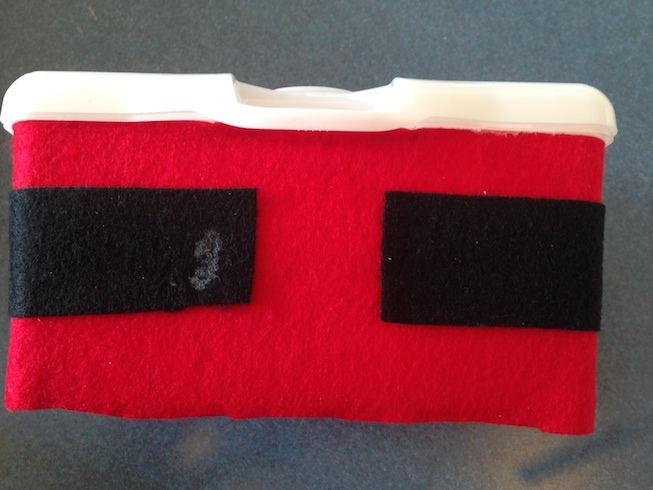 This is a simple craft that recycles an empty baby wipes container. If you don't have one you can still make this out of an old tissue box - it just won't be as sturdy and it will be harder to get your notes back out. 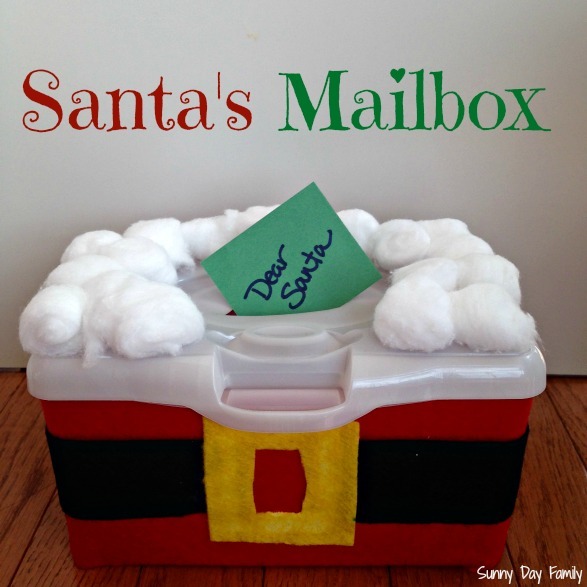 I'm hoping we can make this a family tradition as we write letters to Santa every year! If you use a different size container your measurements will be different. Coat the sides of your container with Mod Podge. 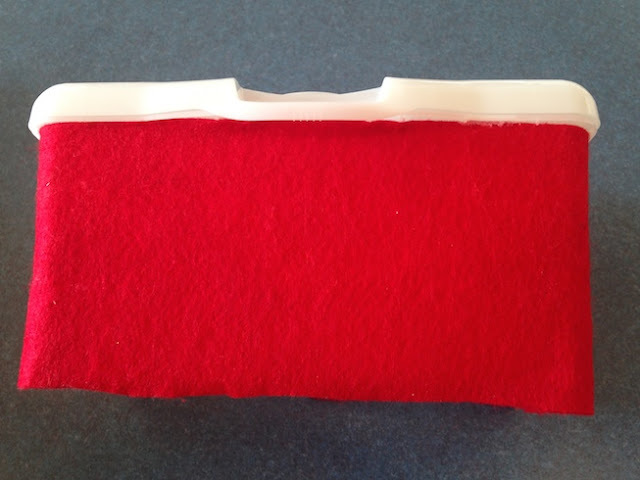 Wrap your red felt around the container and pull tightly. You may need to apply a little more Mod Podge at the seam. Mine had a bit of overhang at the bottom which I trimmed with an x-acto knife once it was dry. Allow to dry. Then put a very light coating of Mod Podge on the back of your 2 black rectangles. Wrap these around your container, leaving a space in the front center for your belt buckle. 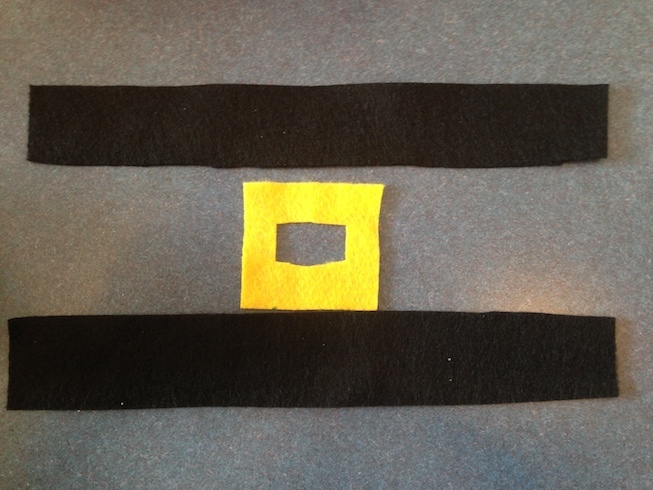 Apply a light coating to the back of the yellow piece and adhere to the front center of your container. 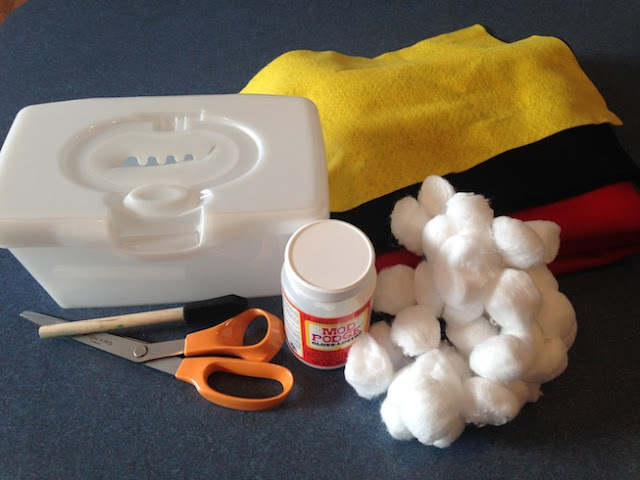 Apply a coating of Mod Podge to the top of your container, leaving the opening clear, and apply cotton balls. Press gently to make sure they stick. Allow to dry. Trim off any excess felt from the bottom of your container and you are done! Santa's ready for mail! 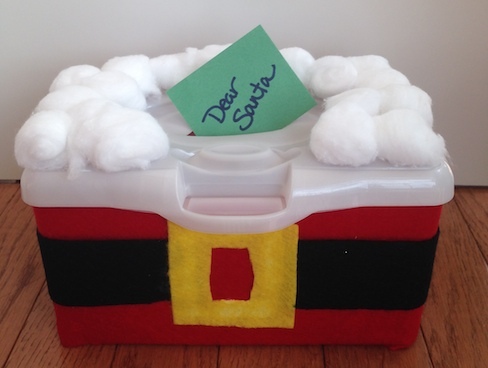 This makes the perfect spot for your kids to drop off their letters to Santa! And, if you have busy toddlers like me, it can provide hours of entertainment. My boys love putting all sorts of things into the box, then opening it and starting all over again. You can also find a good use for all those holiday catalogs that are coming in the mail. 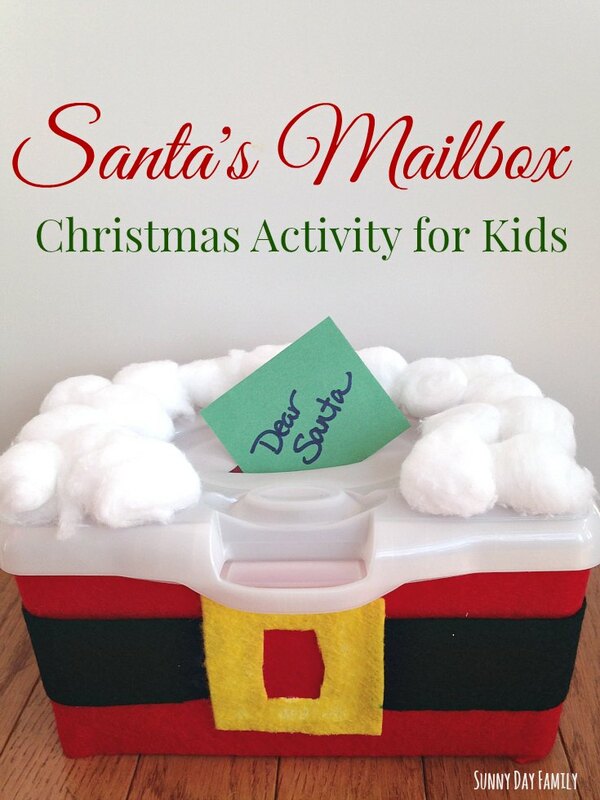 They make great cutting practice for your little ones as they cut out pictures and drop them into Santa's mailbox. Fun and fine motor skills all in one! We've also made "cookies" out of construction paper and fed them to Santa. One of my boys finds this particularly funny. What a cute idea! 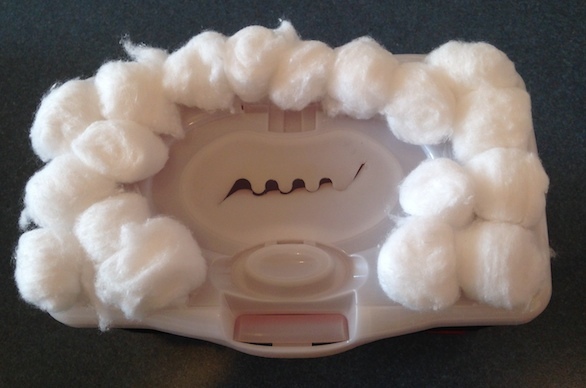 I love that you found another use for the baby wipes container - I used to hate to just get rid of them too! Love this idea, and it would make a great Christmas decoration! This is an adorable idea! Thanks for linking up at the Thoughtful Spot Weekly Blog Hop! We hope you stop by again next week! This is as cute as the Valentine mailbox. This is perfect for wish list Christmas items. Thanks for sharing. So fun! Ha ha. I love it.